Details on this year’s Angelus Press Conference are now coming out. The conference will take place in Kansas City, Missouri (as usual) from October 7 – 9. Our Lord commanded the Apostles to spread the faith and teach all nations; yet, we live in a world where the errors of atheism, agnosticism, paganism, and religious indifference are spread at an alarming rate. It’s a time when, for many, the missionary spirit does not exist. This fall Angelus Press once again brings together some of the best Catholic thinkers, speakers, and writers to consider this year’s topic: The Missions. Come learn more about how The SSPX is working to spread the faith far and wide, while at the same time enjoying the company of other like-minded traditional Catholics. This conference is relevant for all Catholics, young and seasoned alike. 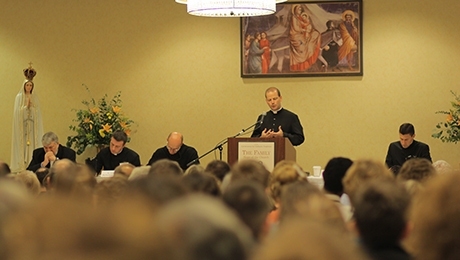 Join us for Angelus Press’ seventh annual Conference for Catholic Tradition – a profoundly enjoyable Catholic weekend on October 7 – 9, 2016 at the Kansas City Airport Hilton in Kansas City, Missouri. Watch for an announcement coming soon on the full speakers’ list! Promotional prices apply to SSPX teachers. Complementary: Priests and Religious that are SSPX get in free. Other priests and religious call 1-800-966-7337 for details. Showing details for Complete Package below. Follow the link for details on the other options. Does not include hotel stay: To take advantage of the special rate we have arranged at the Hilton, please call 816-891-8900 or visit our sign-up page here. This entry was posted in Uncategorized and tagged Angelus Press, Angelus Press Conference, Catholic, Catholic Church, Society of Saint Pius X, SSPX. Bookmark the permalink.